My partner and I found this necklace in his late mother's "junk" jewelry collection. At first, we thought it was costume. However, after taking it to several jewelry stores and then eventually an appraiser, we found that the necklace was genuine. The necklace is a fabricated Georgian style necklace with 23 separate parts, each separated from the next by a single knuckle hinge Each link is a geometric style motif with approximately 214 diamond bead and prong set through the piece (Rose cut natural diamonds, 2.1-7mm, I1-I2, I-J, approx 5.0 cts total weight). On each piece is a blue enamel bar. The entire piece is 18 inches total length with a fabricated chain. Unmarked tested 9k. See photo for design details. manufacture and materials used. Estimated to be made in England. I'd be very interested to know if anyone has seen a necklace like this. 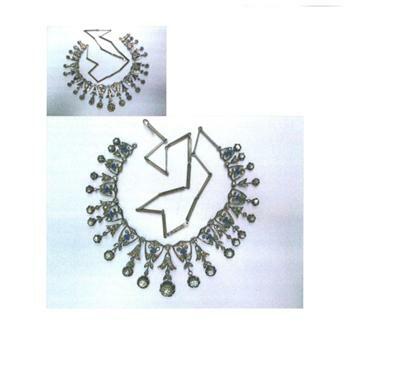 I've looked at hundreds of pictures of Georgian necklaces and can't find a single one that resembles this necklace. Join in and write your own page! It's easy to do. How? Simply click here to return to Your Favourite Antique Jewel.